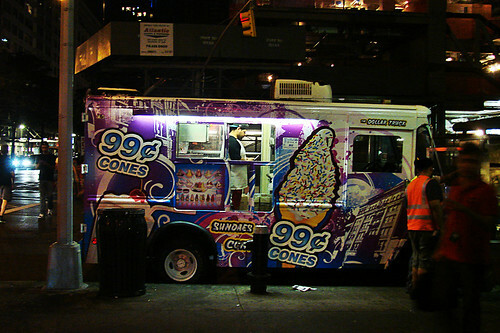 Though the truck is wrapped with alluring illustrations of rainbow sprinkle bedecked ice cream cones, the 99 cent cones are served up plain. Want sprinkles? Prepare to fork over $1.50. And the guy on the truck mentioned that the 99 cent cones were "really small and if you upgrade to a $2 cone you get free toppings. (I do believe I overheard him say toppings not just topping). Additionally they serve sundaes and shakes which are also not 99 cents and like many of their soft serve brethren they don't post prices. My policy with ice cream trucks is to always inquire about the price before I order. I've definitely seen preferential pricing in action at other soft serve trucks before. If they think you're a tourist schnook, you can expect to empty your wallet for that cone. But I digress. 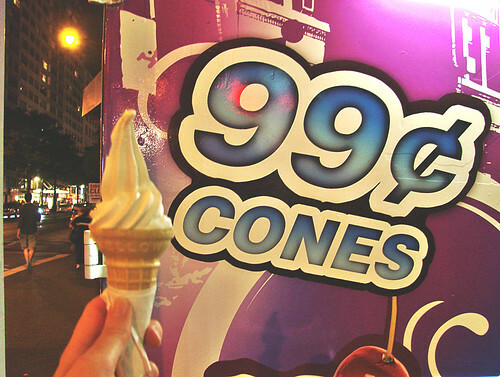 I only had $1 on me so I ordered up the 99 cent cone which was petite as promised. I can't complain that my expectations weren't properly managed at point of purchase. That said, the whole truck screams cheap ice cream. It says "The Dollar Truck" on the side for goodness sake and maybe I should be ashamed to admit it, but the 7 year old inside of me was lured in by the sprinkles that aren't included in the 99 cent experience. It's a decent size ice cream for a little snack or for a kid, but if you're craving a real ice cream cone, I'm not sure this really gives you the bang for your buck. I've heard that some fast food joints like McDonalds have dollar soft serve cones. Not sure what size they are, but they couldn't be smaller than this cone. Got any $1 ice cream tips? Leave 'em for us in the comments!